It's little wonder Amy Garbark is popular in Pittsburgh: Her best-selling screenprint design features a little dumpling situated above the sentence "P is for pierogi." "It sells well, not just locally, but online," says the proprietor of Garbella, a handmade goods studio. "Strangely enough, I get a lot of Canadian orders for the 'P is for pierogi' stuff." Pierogies, bike parts, typewriters — they're all part of Garbark's aesthetic. 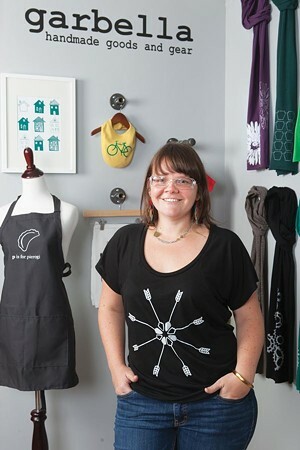 The lifelong Pittsburgher, and former full-time art teacher, has been selling handmade goods (mostly screenprinted clothes and accessories) since 2006. Two years ago, it became her main gig. Garbark delved into the handmade-goods world after her first design, a T-shirt that says, "I [bike] PGH," became popular among friends. Garbark is an avid cyclist; both she and her husband have done bicycle racing and touring. Besides the Garbella shop on Etsy, Garbark's goods are available in local shops featuring handmade goods, like Wildcard in Lawrenceville, Hiptique in Shadyside and So Me in Glenshaw. In addition to T-shirts, her wares include scarves, skirts, aprons and even clocks. Baby apparel is a staple: The "P is for pierogi" theme is available on bibs and onesies, and other designs — bikes, trees, brief slogans — come in baby sizes, too. "My niece is my current baby model," Garbark says, referring to the adorable pictures on her Etsy shop. "She gets paid in babysitting." Recently, Garbella has begun to expand. Garbark takes the shop on the road to craft shows in other cities, and she recently attended her first national wholesale show. While she stays committed to Pittsburgh-pride themes, she isn't ashamed to work the market a little: A design that started out as a typewriter with the phrase "Dear Pittsburgh, I love you" is now available in New York and Chicago version. "That was something I tossed and turned over!" she says with a laugh. "It started out as a love letter to Pittsburgh, and I do love Pittsburgh. But at the same time, I want to have a sustainable business. So I expanded to some other cities." But don't think she's about to take off: Garbark just moved the studio from her Lawrenceville home to 1806 Chislett St., in Morningside, previously the Morning Glory Coffeehouse. Besides getting all that work stuff out of the house, it allows her to have open-studio hours. Her first open house is planned for Fri., Nov. 2. "I think Pittsburgh is nice in that people do want to support other Pittsburghers," she says. "People want to support local small businesses, and that's been a factor in the shop's success."